This morning, I listened to an NPR interview with Karen Armstrong about her new book “The Case for God”. The discussion surrounded the current state of religion, along with some relevant history. However, there is one thing that stuck in my mind from the interview. …the idea of God as a supreme being means that he is simply like us, writ large, and just bigger and better, the end product of the series; whereas this divine personality that we meet in the Bible was, for centuries, regarded simply as a symbol of a greater transcendence that lay beyond it. Some theologians call this the God beyond God. And this God isn’t just a being like you or me, or the microphone in front of me, or even the atom, an unseen being that we can find in our laboratories. What we mean by God is, some theologians have said, is being itself that is in everything that is around us and cannot be tied down to one single instance of being. What a huge statement, right (!?) …that God is not the noun “being” (as in a human being, a person or someone up in the sky), but rather the verb—a state of being! This makes a whole lot more sense to me and explains clearly why people will spend their whole lives in search of enlightenment through meditation. They are trying to get as close as possible to that single essence of being… that god-like state of existence! Just strange that it took me 35 years on this earth to understand a subtle shift in meaning. I apologize if this seems glaringly obvious to the rest of you. 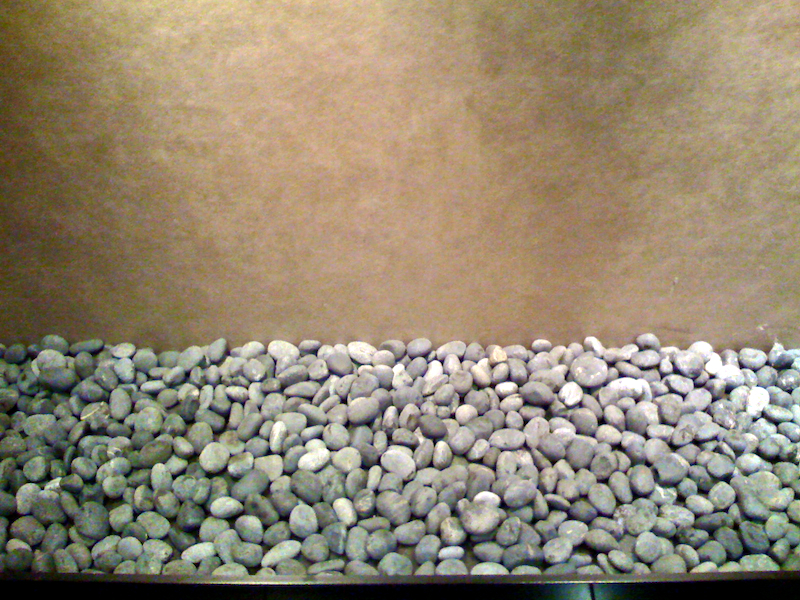 And speaking of zen… this snapshot is taken in the apartment lobby of the Uwajimaya building up in Seattle. I love the minimal quality of the stones and the different textures going on. It was wonderful to run across this in a hallway, especially given that most large apartment situations would render an installation such as this completely ruined. But in this complex context, it works quite well.